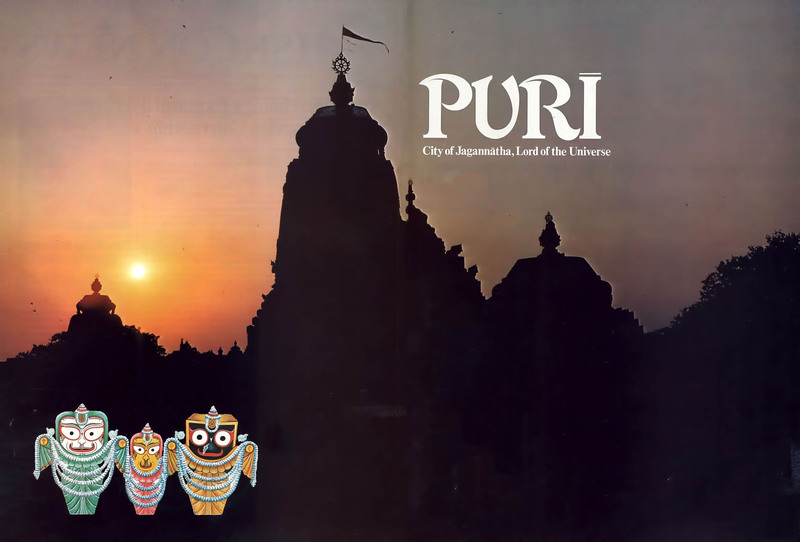 The sacred city of Puri is one of India’s most popular attractions for pilgrims and tourists. Situated on the shore of the Bay of Bengal, this city of 80,000 is most famous for its colossal temple of Jagannatha, the Lord of the universe. Overlooking Puri from atop Nila Hill, the temple’s 215-foot solid-stone tower is visible for miles around. The original structure disappeared long ago through a series of reconstructions, the present design dating from the first century A.D. The location of the temple, however, has always stayed the same. (The most recent reconstruction took place in A.D. 1200 under King Chodaganga and his successor, Anangabhima.) One of the most striking features of the temple is that it rests atop an immense platform in the heart of the city. Also, Lord Jagannatha’s altar room, beneath the central spire, is the nucleus of some thirty smaller temples added in later periods by various rulers. A twenty-one-foot wall encloses the entire complex, where two thousand people work daily in the service of the Lord. 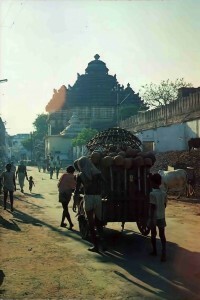 Men, women, and children, residents of Puri, and pilgrims from all over India crowd the temple year round. 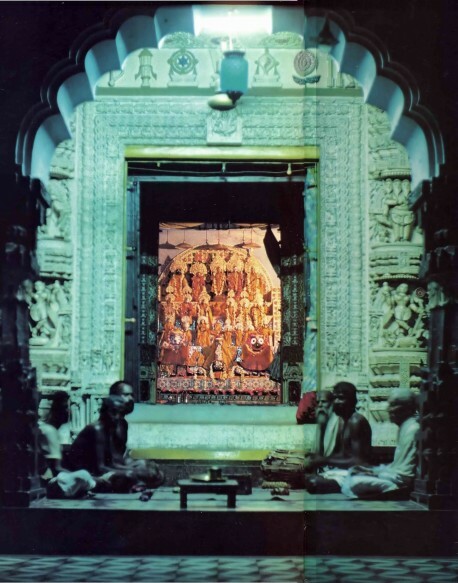 For a glimpse of Lord Jagannatha, they enter here, where two large stone lions flank the East Gate. The sign on the left announces that no foreigners are allowed inside, an age-old custom legalized by the Temple Act of 1803. Within the Puri temple, beyond the reach of Westerners’ cameras, brahmans and astrologers read beautiful prayers to Lord Jagannatha who stands on a six-foot altar. The Lord’s servants bathe Him, dress Him in exquisite hand-tailored garments, decorate Him with flowers and perfumes, put Him to rest, and gently awaken Him. 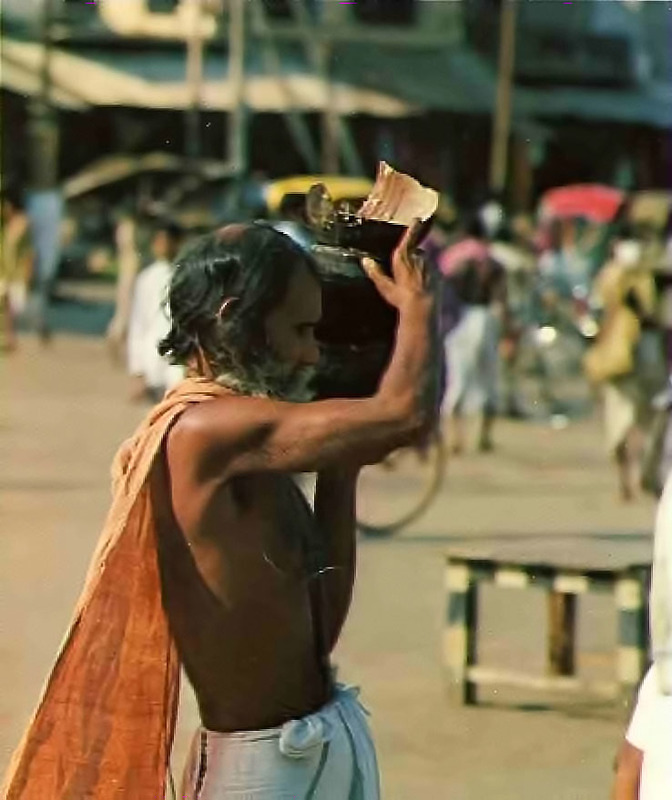 In addition, dancers perform for the Lord’s pleasure, a devoted crew cleans His quarters eight times a day, and His devotees hold many festivals to honor Him. In the Sandalwood Festival, devotees take a small set of Jagannatha Deities to a large bathing pool and set Them in a boat. The Deities then sail around a manmade island, on which sits an exquisite little temple. Every day during the festival, the Deities’ servants anoint Them with large quantities of fragrant sandalwood paste. Many of the Lord’s present-day servants claim to be in the line of His first attendants, who lived thousands of years ago. Oxcart filled with handmade clay pots makes its way to the temple’s main kitchen. Catering to an average of ten thousand every day, and on some festival days ten times that number, the kitchen feeds a large part of Puri’s townspeople. The kitchen’s five hundred employees—cooks, servers, carriers, and sellers—can be mobilized to feed twice as many people as usual on only four hours’ notice. To insure maximum cleanliness and efficiency, the cooks wear surgical-like masks and stay silent while they work. All the food served is spiritual food: Lord Jagannatha first accepts it at one of eight daily offerings. Typical offerings include curried vegetables, cheeses, coconut juice, sweet paddy, soup, and endless varieties of cakes, pastries, and candies. A pavilion outside the Lion Gate sells the tasty preparations to those who aren’t allowed in but still want to benefit by eating spiritual food. The bearded brahman carries on his head a “half-pot” of rice. Half-pots are made by splitting whole pots in half and filling up each half separately—a quick and accurate measuring system from the land of simple living and high thinking. Streets filled with transcendental music greet nighttime strollers in Puri. Among the shops selling food, clothing, and souvenirs on Puri’s Grand Route are many sidewalk temples like this one. Devotees at this beautiful little temple, about a block away from the Jagannatha temple wall, welcome everyone to view their Deities and hear their chanting of the Lord’s holy names. The singing at some temples goes on twenty-four hours a day, seven days a week. Every night, through the main temple’s huge loudspeakers, singers send out the seven hundred verses of Bhagavad-gita to saturate the city’s atmosphere with transcendental sound. Carving and painting Jagannatha Deities is a long-standing tradition for the craftsmen of the Mahapatra family. They say this work has been going on in their family for “uncountable generations.” Here Sridhara Mahapatra carves Lord Jagannatha out of wood from the medicinal nima tree. His uncle, Gopinatha Mahapatra, applies finishing touches. Gopinatha’s son, Krishna-candra Mahapatra, is a twenty-year old college student who helps with the business transactions. At their shop, about a quarter of a mile from the main temple, the Mahapatra family sells Deities to pilgrims and local residents, who take Them home to worship. Almost everyone in Puri has Jagannatha Deities in his home, and most children grow up with their own set. Every year, Sridhara helps carve the decorations on the gigantic Ratha-yatra cars. He proudly shows visitors the Certificate of Excellence the government has awarded him for his carving of the cars’ decorative horses, drivers, and other figures. Like a king on a pleasure excursion, Lord Jagannatha goes out for a ride every summer in one of India’s biggest religious festivals—Ratha-yatra (“The Festival of the Chariots”). One of the most important holidays for devotees of Krishna, Ratha-yatra originated here in Puri, where hundreds of thousands of pilgrims jam the city to join the parade. They pack the Grand Route, a street as wide as an eight-lane highway, and fill the nearby buildings and rooftops to get a good look at the three colossal chariots carrying, in order, Balarama, Subhadra, and Jagannatha. For a month before the celebration, over a hundred craftsmen—forty-two woodcarvers, thirty laborers, fifteen painters, ten tailors, and nine nailsmiths—work long and hard to build the chariots. On the festival day the heavy, six-foot Deities are taken out of the temple and carried toward the cars. 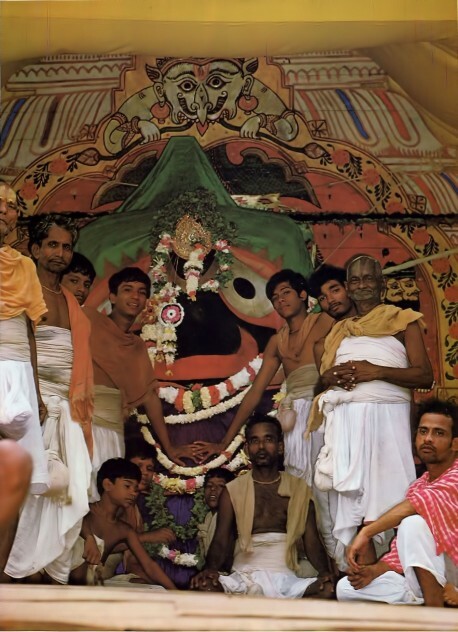 Broad-shouldered devotees swing the Deities back and forth gracefully for Their pleasure as the Raj of Puri, observing a time-honored tradition sweeps Their path with a gold-handled broom. An official tourist handbook explains that “this practice brings home the idea to everybody that the highest political head of the State is not superior to a sweeper in the eyes of God, who is the Supreme Object of Worship by everyone on the face of the earth.” At last, the carriers hoist the Deities up onto Their colorful vehicles with strong silken ropes. Canopies of red, yellow, green, and black billow and sway as Their Lordships settle in for the ride. Now the two mile journey begins. Pilgrims tug the huge cars , speeding them up and slowing them down with big ropes tied fore and aft. 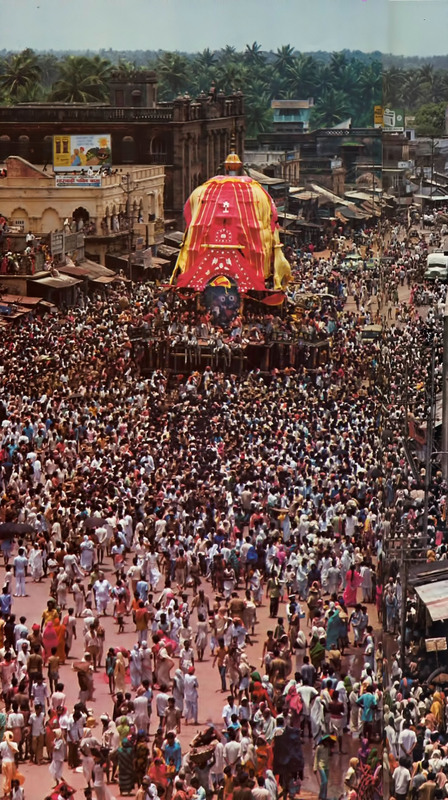 All afternoon the procession plows through the sea of worshipers chanting “Jaya Jagannatha! Jaya Jagannatha!” (“Victory to the Lord of the universe!”) After several hours They reach Their goal: the Gundica temple, where the Deities will stay for nine days to “freshen up.” During this time Their servants repaint Their features; then the Deities emerge and go back to the big temple even more bright-faced than before. The return journey is another occasion for celebration. After the festival, attendants reinstall the Deities in Their former places on the temple’s main altar. 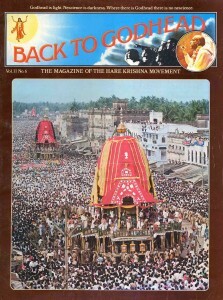 There They will remain until next year’s Ratha-yatra, the most spectacular offering to the Lord of the universe.